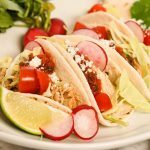 Crock Pot Shredded Chicken Tacos are easy to make, flavorful and delicious! If you love a great slow cooker meal, you need to make this today! Add all of the chicken and onion to the slow cooker. Sprinkle with the cumin, garlic powder, salt and pepper. Add the bay leaf and top with picante sauce and chicken stock. Set heat to low, cover with lid and cook for 8-10 hours. When the meat is tender, remove it from the slow cooker (save the liquid in the slow cooker - for the next meal) and shred the meat with two forks. You'll have about 8 cups of shredded chicken. For tacos simply pile the meat on corn or flour tortillas with your favorite toppings; cabbage, salsa or pico de gallo, sour cream and jalapenos. Use the toppings that you like best! You'll have the meal on your table in 30 minutes. Flavorful, but not too spicy, this is an easy weeknight meal!